These chlorinators are designed for safe, trouble free, convenient sanitisation of pool water using world leading sanitisation technology for healthy, clean water. Constructed of strong corrosion and UV resistant materials for a long and reliable working life, every unit is factory tested for pressure and performance, further adding to this quality and reliability. Safety features include dry run protection from overheating if no water flow is present and a backwash feature that inhibits gas build-up during backwash and rinse cycles and prevents extended backwashing times. 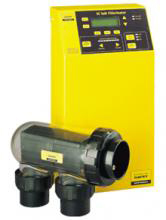 With ABS quick connect coupling for simple installation, a time clock for automatic operation and a digital display and touchpad for easy programming, this chlorinator almost operates itself as it also has a self-cleaning cell that provides low maintenance and optimum performance.